Proceed for One Mile past the entrance to the BUTTERCRANE and QUAYS Shopping centres. Get to the next set of traffic lights at KFC and take a left. This will bring you along the front of the BUTTERCRANE (on your left) alongside the CANAL (on your right). Get to the next set of traffic lights in the left hand lane and turn left (at the QUAYSIDE BAR). Take an immediate right turn down CORNMARKET STREET. We are 50 yards down that street on the left hand side. Take the A1 South to Newry. Leave the A1 at the first exit for NEWRY.At Roundabout Marked 'Mourne Country Roundabout' Take the 2nd exit marked for NEWRY. Continue into the city, going through 2 round abouts. Get in the right hand lane at the lights and go past the town hall. This road will sweep to the right and bring you across a bridge between the Canal Court Hotel and Bellini's. 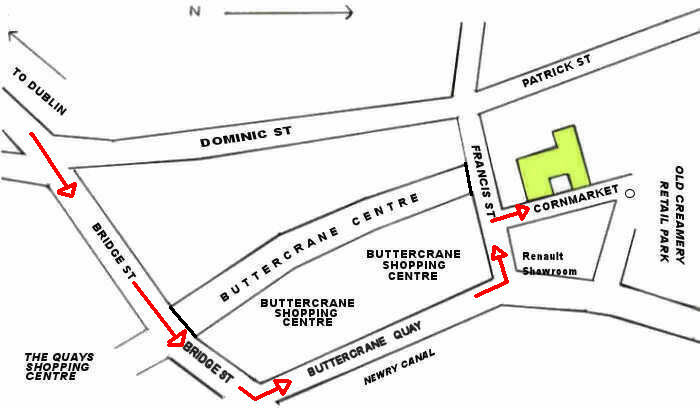 Go straight at the lights and take your next left into The OLD CREAMERY Complex where Dunnes Stores and TK Maxx are. Drive through the complex and you will see a 3 story stone building, our premises are at the gable end of the building.